Click the button below to add the To the Griot by Wilson to your wish list. Description: To the Griot is an hommage to the Jeli or the Griot, the musician, magician, politician, jester, oral librarian, historians of West Africa. The African harp, or the KORA is the instrument that the Griot use to accompany themselves. The music played on the KORA has a magical quality that, for me, is based on its polymeter and angelic ringing sound. I tried best to honor these qualities and the history of the noble men that have continued this tradition of music making. "Wilson brought out every nuance of the phrase in a wonderful program" - Brian Dunbar The Seattle Classic Guitar Society "If you haven't heard Wilson play, don't miss him" - Gavin Borchert The Seattle Weekly. Passionate playing with clear technical command and a compelling story behind each composition are what Wilson brings to the stage. Performing regularly at festivals and concert series through out the Greater Northwest Wilson has distinguished himself as a unique voice with programs that feature his own transcriptions of new works for the guitar by such greats as lutenist Sylvius Leopold Weiss, or transcriptions of the harpsichord music of Francois Couperin. One of the most exciting of these is Wilson's transcription of a work that JS Bach transcribed from Sylvius Leopold Weiss, and then arranged for harpsichord with a new violin part written by Bach. Wilson is privileged to have had a number of works written for him by composers such as Mesut Ozgen, Michael Timpson, Charles Atwood, Nathen Jensen, Jim Clarke and Paul Messler. Wilson's performing career has taken him to Carnegie Hall's Weill Recital Hall with the new music group Ensemble Sospeso to concert halls across the US. As a student, Wilson performed on a 13 city tour of Hungary, performing at the Royal Palace of Budapest and Pannonia, a 1020 year old monastery, among other places. He earned his Master's in Classical Guitar Performance at the Eastman School of Music in Rochester, New York and he earned a Bachelor's of Music as a double major in Music History and Classical Guitar Performance at Western Washington University. 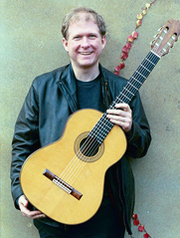 A graduate from Eastman School of Music in New York where he completed his Masters degree in Classical Guitar Performance, he studied under Nicholas Goluses. Wilson's compositions for the guitar have been appearing on stages throughout the Northwest US and Canada for over 15 years. The main medium he works in is the relatively unexplored genre of multiple guitars or Guitar Orchestra. Wilson is the conductor, composer, arranger and music director to the Guitar Orchestra of Seattle. The number of players in Guitar Orchestra has ranged from 8 to 40. His pieces have been described as sonic wonderlands incorporating elements of Balinese Gamelan, 18th century counterpoint, Chemical Brothers and the Shash Maqaa'm (this being the grand musical tradition of the Uzbek and Tajik peoples of Central Asia). Wilson has run 34 workshops over the last 10 years, often writing most of the music performed. There is always a specific focus of the music; some of which have been programs exploring the cultures of the Silk Road, Latin America, Spain along with obscure composers from the late 18th century such as Jan Kritic Neruda and Johann David Henichen. Some of the venues Guitar Orchestra has played are Nordstrom Recital hall, Victoria Conservatory in British Columbia, Soundbridge, Phinney Neighborhood Center, and the annual Seattle Classic Guitar Society Holiday Concert at the Seattle Mennonite Church. His compositions for choreographers Michell Steinwald and Holly Eckert, a completely improvised score in the former and the latter being a heavily processed score, had performances at the Vancouver East Cultural Center and Artswest. Wilson is currently on the faculty of Bellevue college teaching courses on the history of rock n roll along with guitar courses. He teaches privately at the Rosewood guitar and enjoys walking to work on the days he teaches there.